My Mama has had a hell of a time these past two years. 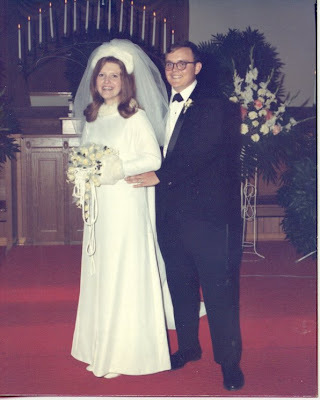 My mama married my father when she was 18. He died when she was 56. This has to be the hardest time in her life. Her life and her self have been torn apart, broken, split, shattered, what have you, and she has a major wound that she has to heal from. We all do, but I think she has it the worst. I know when she reads this, she's going to think that I'm announcing to the world that she is having a hard time. Actually, that's not quite true. Considering the degree of trauma that she had to endure, she has been able to get up in the morning, walk out the door, and walk through the world pretty damn well. I want to be clear, though, that returning back to life as normal after a traumatic event has nothing to do with personal strength and isn't really something to applaud. Sometimes it's wiser to stay in bed and cry. Americans forget this. Anyway, all I'm saying is that my Mom has had a hard go of it, as anyone would, and I'm not making any judgement good or bad as to how she has dealt with my father's nightmarish death. Let's go to another topic: Am I really Southern anymore? The end of January commemorated my seven year San Frantastic anniversary. My accent resembles that of a news anchor more than a person on the street I grew up on. I actually leave the house regularly without drying my hair, and I only wear lipstick sometimes. I drink unsweetened hot herbal tea way more often than sweet iced tea, and my favorite fried food is a jalapeno. And yes, sometimes, when people are really friendly to me and I don't know them well I think they want something. But I still have long hair, use moisturizer religiously, smile at strangers on the sidewalk, park a linen chest at the foot of my bed, call my Mama "Mama," and--the one really matters--if someone is upset, sad, tired, happy, or at my house, I comfort them with food. But out here in California, at least among the folks I know, food that comforts is also good for you. At home, comfort food is chicken n' dumplins, country fried steak, honey-baked ham, grandma's green beans, mashed potatoes and gravy, macaroni and cheese casserole, sweet potatoes glazed with brown sugar, black olives from the can, cornbread, biscuits and apple butter, pecan pie, and deviled eggs. (Actually, they're "aggravated eggs" because grandma, as a good Baptist, didn't like to even say the name of the evil one.) These are foods that I grew up eating, not every night, but regularly. And they are crazy (!) delicious, but if you are sick or sad, these foods aren't going to make you feel better, and they are going to hurt you in the long run. I want to comfort my Mama with good food that makes her feel good and helps her body heal and be strong so she can walk around and do what she needs to do. Since I've lived in California, I have, over time, drastically changed my eating habits. Now I think of comfort food as food that's simple to digest, cooling or warming, satisfies your appetite and makes you feel good all day or evening. It's soup: veggie-heavy broth-based soup (noodles optional), miso soup with tiny cubes of tofu that you drink out of the bowl, pineapple-broth vietnamese soup with snapper. It's cold salads with gentle dressings like garbanzo bean salad with cilantro, corn, and egg and sweet miso dressing. It's sushi: cucumber sticks in the middle of rice rolled in salty, crisp seaweed. It's yogurt, fruit, and granola: the holy trinity of breakfast that tastes awesome, quells hunger, and makes you feel cold and good until lunch. I know you're thinking I've got all "uppity" and gone fancy, but with the exception of the pineapple-broth vietnamese soup, these foods are easier to make than almost all of the Southern food I mentioned above. Mama, I can't be there to cook for you, so, as I promised, here are some recipes that taste good, are easy to make with ingredients that you can get in Georgia, and are good for you. All I ask is that you put it in your mouth and chew. Stock up on slivered almonds, currants (more delicious than raisins, not too expensive), and pumpkin seeds (way better than sunflower) at a health-food store with bulk bins (Whole Foods, I mean Whole Paycheck). Keep them in the freezer. You can add these three things to any salad and it's wayyyy better. A chopped apple (fuji or pink lady, the rest are often mealy or too sour) is a nice touch. That's probably good, but if you want to take it to the next delicious level, add a SALTED avocado and a SALTED hard-boiled egg. Please don't overcook the egg so that it gets that depressing gray ring around the yolk. If it's still orange-y clear in the middle, you are so lucky, salt it and eat half of it right then. It will flip you out with its crazy delicious power. Don't do oil and vinegar, or any vinaigrette, it will pucker your mouth and ruin the sweet wonderful thing you have going. Or you can take that egg, that avocado, some plain GOOD yogurt (buy the fancy stuff on this one), some soy sauce, and honey and mix it up and that will work too. I mix SriRacha, or rooster sauce, a hot chili garlic sauce in there too, but I know you don't like spicy things. Toss the hell out of it before you spoon it into your bowl. Leftovers are perfect for breakfast (try eating salad for breakfast and see how your day goes), but will keep for 24-48 hours. You will love me for this one. I will become your favorite child. This weekend my car got towed from a mall parking lot because I left it overnight. It cost me $457 dollars to get it back. I left the same car in another mall parking lot overnight four days later because I am proud and have a sense of justice. It was still there today and things are made whole again. This year I have been waking up a few minutes earlier every day in order to have my brain be all spit-shiny fresh for longer in the day (I work better in the morning). I'm at 7:15 am now, but this weekend I woke up at 5:40 am one day, 1:00 pm another, 12;00 the next day, and 11:00 another. I've been working at least two hours a day since January 6th on my masters thesis, but in the last five days I have read only one essay. I forgot about two quizzes I was supposed to take for Spanish class. This weekend I kept forgetting to put my make up on. I let my hair air dry and I wore my boyfriend's ripped up t-shirt. A Smithsonian photographer spotted us behind the counter at the Henry Miller library and made me read to Eric for an hour while she photographed us. I am not making enough money and I need more work but this weekend I went out to eat and it was on me. This weekend I'm not afraid of what I'm supposed to do, write, or pay. I'm in love. I have been for awhile.